This hasn’t been a great month, things were going pretty well, and then they weren’t. I started having trouble with my lungs again, I went to the after hours clinic but the Doctor there wasn’t to sure, he gave me an inhaler and sent me for a chest x-ray. It helps sometimes but feels more like a bandaid. I do really need to get in to see my own doctor since I trust her much more than others but that’s hard to do when you don’t get sick days and your doctor is in a different city from your office. Sweeping one of the MEC runs, very happy wasn’t leading the run that day as I was tired! And then 2 weeks ago I’m feeling like my hormone levels suddenly went crazy, everything was fine and then out of nowhere I put on a bunch of weight within about week. I thought maybe my PCOS was flaring up but so far no obvious trouble there for this month. I also started feeling incredibly tired and I’m way more sore after workouts then I should be. So it’s been hard to get myself out there particularly on the weekends since I’m so tired and laziness just leads to more laziness for me. Think I may need to make some diet adjustments and maybe cut out sugar again to see if that helps kick things back in place. Despite all this it hasn’t been the worst training month, I’ve gotten all my long runs in, the only one I missed was the weekend my lungs were really bad and last weekend I rested a lot more than intended since I’d been so tired but still got out for my long run thanks to it being a long weekend. Grateful to some awesome running friends who keep me going! This weekend is a scale back weekend for me so I’m taking it easy again and hoping I can kind of reset everything. Yesterday I did Polar Rush with another Burly which was a lot of fun but a struggle in the snow. 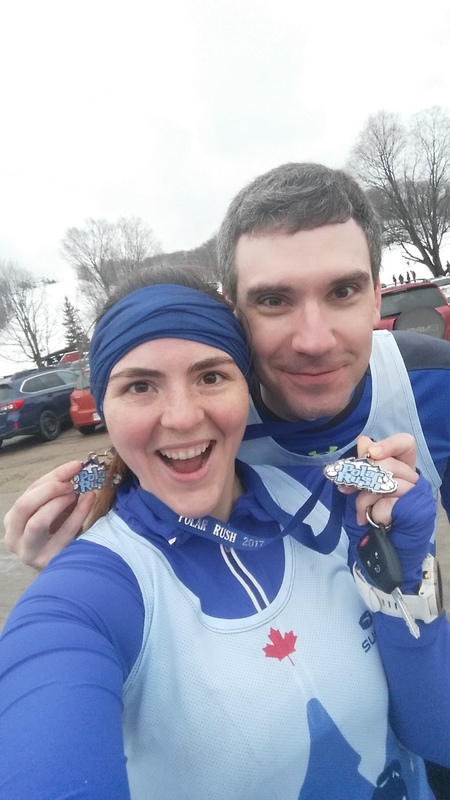 They had a lot of snow up there (Barrie) and with the mild temperatures the snow was not the good kind for running in. Most of the course hadn’t been well trampled yet since we were in an early wave and we also had to try to manoeuvre around deep foot prints that had been made some time before the event when the snow was fresh. Made for a slow slog through the snow but a fun time. 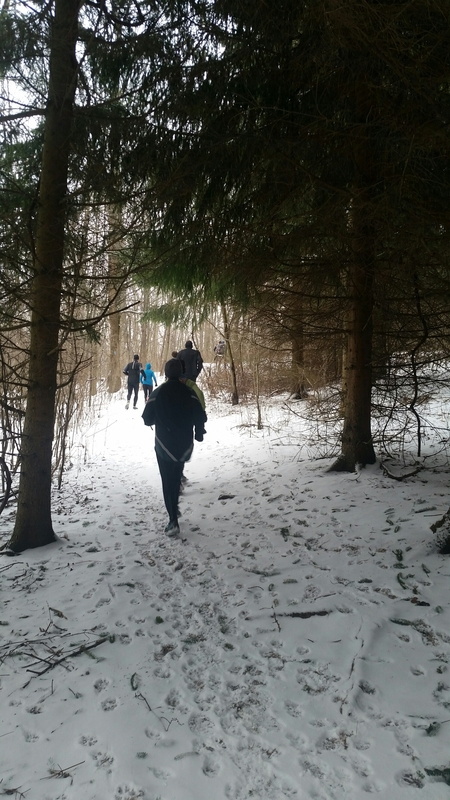 We were going to go for a run after but with the conditions we’d just gone though we were not eager to check out the rest of the trails around the resort so we headed back home instead. I’m feeling positive about March being a better month, I’ve been a bit isolated this month socially since friends have been busy so I’ve been spending a lot of time alone which is never good for me and hasn’t helped my situations. But my best friend should be around again also it’s my birthday month! And my birthday is on a Friday this year so that’s awesome. I may see about taking a half day or maybe even the day off and getting in a run :). Yes! Looking forward to sunshine. 2 more weeks until daylight savings!